Did You Hear Them? Take-Offs & Intervening Landing By F-18's As Part of Toyota Grand Prix "Fly-By"
(April 13, 2003, updated April 14) -- Did you hear them? Several F-18s made two take-offs and an intervening landing in connection with the April 13 Toyota Grand Prix of LB. The F-18s, which arrived late Friday afternoon (April 11), took off from LB Airport at about noon April 13, flew over the LB Grand Prix, then returned to LB Airport (one over ELB, right) about an hour later. Further details, including noise levels, were not immediately available. It is standard procedure for F-18's to use afterburners on take offs, producing noise levels expected for military purposes significantly louder than commercial aircraft. 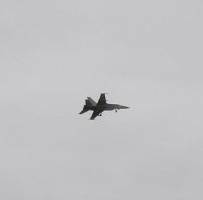 An March 30 F18 fly by following a CA Angels game produced noise measured at or slightly below 111 dB. The highest level allowed for LB commercial departures is 102.5 db single event noise level and many are in the 90 dB range. Military flights are categorically exempt from LB's Airport noise ordinance limits. City Hall treats the F-18 flights for the CA Angels game and LB Grand Prix as exempt, meaning their noise did not violate LB's noise limits. The Toyota Grand Prix of Long Beach is owned and operated by Grand Prix Association of Long beach, Inc., a subsidiary of Dover Motorsports, Inc.